"I always think that schemes are overrated....We're going to attack out of a multiple array of fronts. If I had my druthers, I'd like to play a 5-4-5, which you're not allowed to do. But I want the offense to feel...like we've got about 13-14 guys running around. We want to look like we have an unfair advantage." The youth movement injected into the University of Texas program has generated a lot of buzz recently. The hope is that the new found energy translates to on the field production after a lackluster performance during the 2010 season. One reason to be especially excited is that replacing legendary defensive mind, Will Muschamp, is Mickey Andrews / Chuck Amato protégé, Manny Diaz. Diaz’ eager hustle, passion for fundamentals, and keen attention to details is apparent in his body of work through NC State, Middle Tennessee, and Mississippi State and are what have propelled him on the fast track to success. Having never played college ball, Diaz doesn’t get caught up in over-complicating the game, but keeping his scheme idiot-proof. “Offense and defense is about asking questions and having answers. With the advent of the versatile 1-back gun in today’s offenses, defenses need to account for so many attacks that they must figure out what exactly they are looking to defend. Diaz believes that to stay ahead of the curve, to, a defensive coordinator needs to force the ball to go where he wants it to go, rather than attempting to just ‘defend the whole field’. With this approach, you are left with even more reason to include fire zones. Throughout the 90s by the way of Miami, defenses transitioned to the mantra of speed, with the defensive ends becoming the most disruptive players on the field. The more offenses game planned and tried to deal with these athletes, the more they realized they just couldn’t block those guys. This is what has brought us to the current flavor of offense, where they don’t even block the defensive ends (read game). Combating the gun option, Diaz feels the fire zone is the perfect RUN defense because of the key-breaking look it presents. 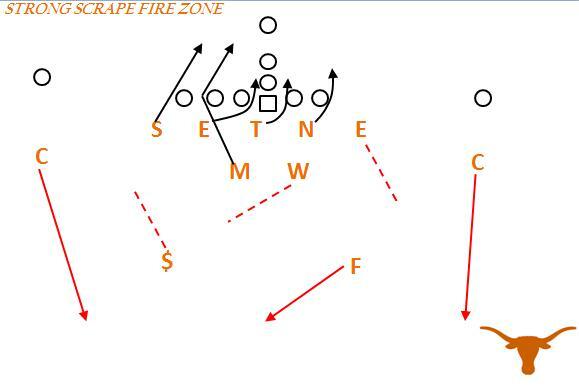 In most fire zones, you will overload one side of the ball with 4+ rushers with the backside dropping into coverage. For a quarterback, you are faced with a confusing picture. If you read the backside end on zone-read, a defensive end that crashes (attacks the back) will tell you to pull the ball and run. 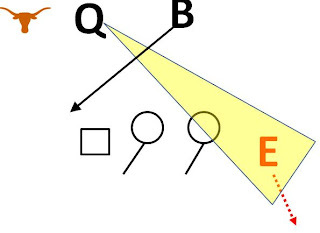 If the backside end hangs or stays lateral, the quarterback should give to the back. The problem is, against the fire zone, “none-of-the-above” is the answer. As you see in these pictures, if a quarterback sees the backside end hanging (not attacking the backfield) as he would if he were dropping, the quarterback would give to the back, who would be running straight into the teeth of the blitz. With the fire zone, Diaz feels he can get the best of both worlds as it is an 8-man front with middle-of-the-field support with 6 defenders covering 5 potential receivers. “Its just Cover 3 with a hook player blitzing – that’s a fair exchange. A large part of the success Diaz has experienced with fire zones is due in large part to the way he employs them. Simplicity is the key, contrary to most defenses, Diaz believes in spot-dropping with his 3-deep, 3-under to prevent his defenders from thinking or making mental errors. In this post, we explore how he defines and installs his foolproof approach to the fire zone. Much like how Nick Saban installed his middle-of-the-field coverage principles (curl-to-flat / hook-to-curl players), Diaz teaches ‘jobs’ instead of specific instructions. There are only 3 positions to be defined for this to work. The only thing that a defender needs to know is which one of the three will he be (and adhere to the simple rules for each). 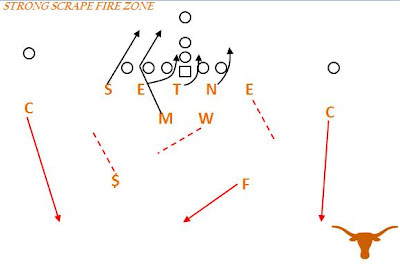 The basic 3 deep fire zone features a long sticking defensive line away from the blitz with two backers or a backer and a defensive back rushing. The simple rules of this scheme allow you to mix and match who will be the rushers. Diaz has found that when running fire zones, they eliminate front calls (less for the defense has to worry about) with the only thing the defensive line has to know is that there is a fire zone going on and which side the blitz is coming from. When you know that, the line will just align away from the gap they intend to stunt to. Defender is a curl-flat player. “Hot 2” means #2 receiver will be the hot target versus blitz (receiver will stem 5 yards and turns around against blitz). This defender simply has to control #2 (or whoever becomes #2) hot versus a pass read. The landmark will be 2 yards outside the hash (or the hash to the field in high school). If the quarterback continues to drop, he will get to 12-14 with his eyes on the quarterback. Versus a run read, this player is the contain / force, and will outside-in leverage the ball. This is a simple job. On pass, he is simply to get to the middle of the field (regardless of where #3 is) defending space in the hole. If the quarterback continues to dropback, he will fall to a depth of 12 yards. Versus the run, he simply has to recognize who #3 is and relate to him and spill with inside-out leverage. Versus option, he is a dive player only. The Hot 3 player is the only player that can exchange assignments with a defensive end (called “switch”). 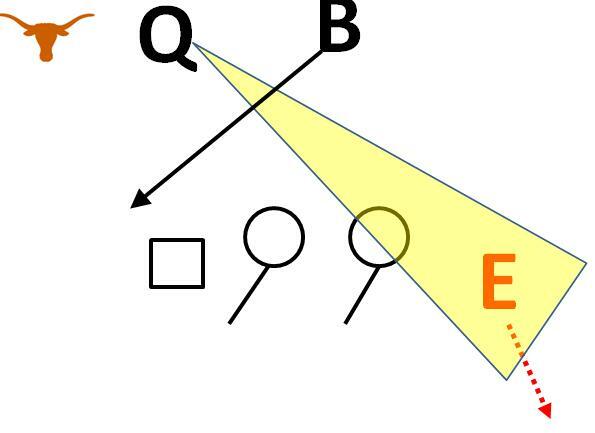 Switcher – is the linebacker away from blitz that will be the Hot 3 player (DE away is the Hot 2 player). If there are two receivers removed, the DE can’t possibly play the curl (Hot 2) so the Hot 3 player (linebacker) will make a “switch” call. All this does is ensure that the offense doesn’t make you check out of the blitz or out-leverage you. 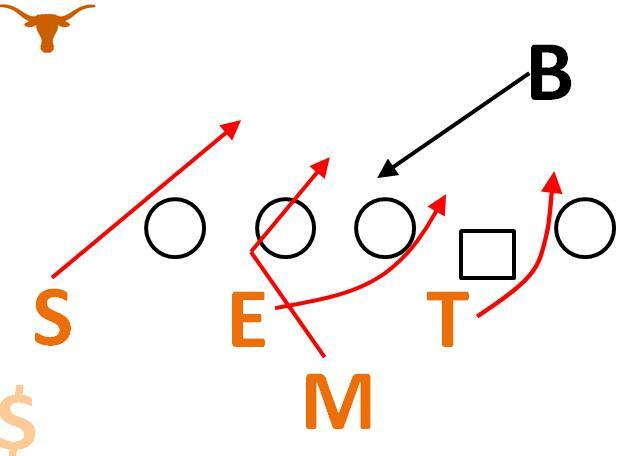 The Hot 3 and Hot 2 will switch assignments and the linebacker will walk-out and align inside #2. This player will drop to 4 yards outside hash (2 yards outside the high school hash) to the boundary. Like the other Hot 2 player, he will drop to 5 yards against quick step and 12 yards against drop back pass and will be contain on run with outside-in leverage. Usually the Hot 2 to the boundary will be a defensive end (brining field pressure). The coaching for the defensive end is simply, “Just go backwards” – that’s it. When in the boundary (“hot off of #2”) if #2 is in the backfield (i.e. some type of 3x1 to the field), this player must tackle him if he runs an inside run. In the boundary, this technique is exactly like you would play as an outside linebacker in a traditional 44 defense. *Once you declare who #3 is, all of the pieces fall into place and there remains no more thinking involved in the defenses. When bringing extra pressure with backers and backs, one of the rushers will be the outside (or contain) blitzer. This player is geared to get after the quarterback, but must recognize how he fits into the blitz. On back flow away, he will have the quarterback outside-in. With flow to, he will tackle the running back (on play-action or not). Versus lead-option, this blitzer will immediately take the quarterback (as the Hot 2 player outside of him will take the pitch). Diaz will teach how to drop to the field for a month to build competency, then will acclimate his players into counting guys and understanding the support fits against the run game. The beauty of this approach is that the fire zone now becomes an “offensive play” for the defense and can be practiced during 7 on 7. The rationale here is to install it (all of it) quickly and just run it over and over to work out the details on the fly. The most underrated element to Diaz’ approach to fire zones, is the coaching of the blitzers. With the fire zone, the defenders are attacking PEOPLE (not gaps). The stunts tell the players how to penetrate, then attack the passer. The mindset here is to treat blitzers like ball carriers (the blockers are tacklers), that after taking the proper path, the blitzer should “find the open grass”. Instead of telling a player to “blitz the A gap”, he will sell it as “you blitz the guard”. The philosophy is to take the path of least resistance; the quickest way to disrupt the passer. The blitzer will fight the soft shoulder of the blocker (not try to struggle where the blocker is strong). If the blocker sets hard inside, the blitzer has the freedom to bounce his path and fight the soft (outside) shoulder and take the easiest way to the quarterback. With any good attack, you need a counter-punch, a change up. With playing MOFC coverages such as Cover 1 and 3-deep fire zone, it is important to keep an answer up your sleeve for when the offense gets wise to what you’re doing. The TRAP fire zone is strong where fire zone coverage is weak. With Trap Coverage, Diaz uses man-match coverage (not spot dropping….except for the flat defender). Trap fire zone is just a changeup that will have two blitzers outside the Mike linebacker (which can play havoc on protection that adjust to the MLB). Just as detailed above, once you define the jobs within the coverage, plugging and playing defenders can be simple. “SEAM PLAYER” – Defender will be inside and on-top of whoever is ‘seaming’ unless he goes to the flat (look up inside cut to the curl). “BUZZ / TRAP PLAYER” – This will be the strong end to the call and will be the buzz defender (playing from inside-out position) that shoots to the flat away from the trap defender. The corner to the blitz side will be the trap defender (corner is playing from wide position). This corner should be trying to show that he’s 3 deep as he is in fire zone coverage, but will be hanging on the flat. The rationale here is to make it look like a blown assignment by the corner. He will plays the gap inside #1 on run. As a trap player, the corner will rob the slant or he will carry #2 on the wheel. Again the simplicity here is what is important; when the trap player doesn’t even move, he ends up in a better leverage position. 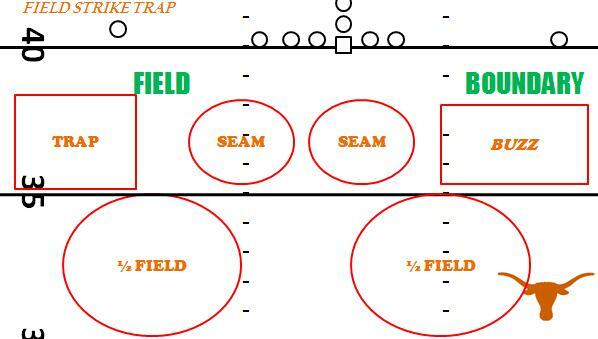 Because you have 4 underneath defenders, there is no switch call in trap coverage. As you can see there is nothing revolutionary to what Diaz is doing, but the method he uses to simplify his scheme and is something that can be picked up by young players and develop a hyper aggressive defense that appears multiple and complex but remains easy to digest. Can someone explain the "long stick" reasoning? Why take such a big sweeping move? I know you are creating the cross with the end and the LB...but I don't see a high school D-end pulling that long stick off. you don't have to long stick,but how else are you going to keep gap integrity inside? I'm a little late to the party here, but vs the zone read look, when you zone blitz the side away from the RB and drop the DE on the side toward the RB, aren't you leaving the veer (or speed option) to the RB side wide open, and with your LBs slanting away from it as well? Part of what makes the read option effective is that it pairs so well with the single-side options. I also have a hard time seeing the 3-3 zone as a base pass defense, especially with the underneath defenders spot dropping. How is the seam not left wide open? Does Diaz just guess when to run the roll cover 2 (which may be better, but still not ideal, vs seam). I can't argue with what works; I guess I'm just surprised that it works. We long stick our d ends in high school all the time. Simple rule...5 tech rips to the A gap, if the guard blocks out on him cross his face to A gap; if guards blocks down or zones inside he is rushing hard off guard's backside hip.